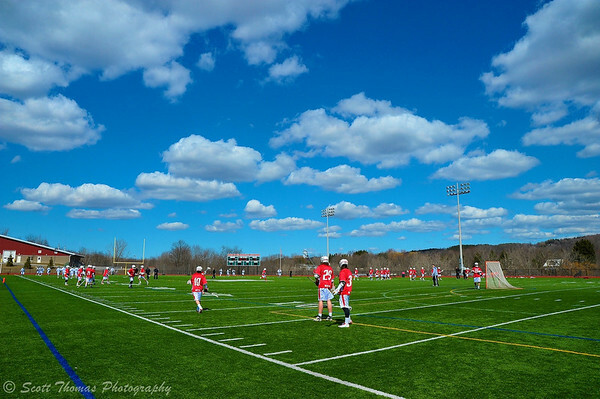 Baldwinsville Bees Boys Lacrosse team visited the Marcellus Mustangs on a picture perfect Spring day on Saturday, March 30, 2013 in Marcellus, New York. Nikon D700/24-85G, 1/500s, f/16, ISO 720, EV 0, 24mm focal length. The High School Sports calendar has changed from Winter to Spring. In upstate New York, Field Lacrosse is the premiere sport. Many ice hockey players tend to also play lacrosse. In fact, one of the Baldwinsville hockey players asked if I would photograph the lacrosse team this year. After making a few inquiries with the school, I got permission to do so. As you can see above, my first game was a picture perfect Spring day. The day was bright enough so I could use the Nikon 80-400mm f/4.5-5.6 VR AF Lens on the Nikon D7100 dSLR camera with the fast shutter speeds needed to cover lacrosse. The field game is much different than the indoor Box Lacrosse I have photographed the last couple of years. Not as physical a game, more players and with a large field which is wider than an American football field. In other words, lots of action. The kind of sport I like to photograph. In field lacrosse there is lots of running (upper left), carrying the ball (upper right), face-offs (lower left) and goalie saves (lower right). All taken with a Nikon D7100 and 80-400VR lens. The lens which, on a DX camera like the D7100, has a range between 120mm and 600mm. This let me get frame filling photos of the players as they competed through four twelve minute quarters. Baldwinsville Bees Connor Chapman (12) with the ball against the Marcellus Mustangs on Saturday, March 30, 2013. Nikon D7100/80-400VR, 1/1600s, f/5.6, ISO 1100, EV 0, 400mm focal length (600mm DX). 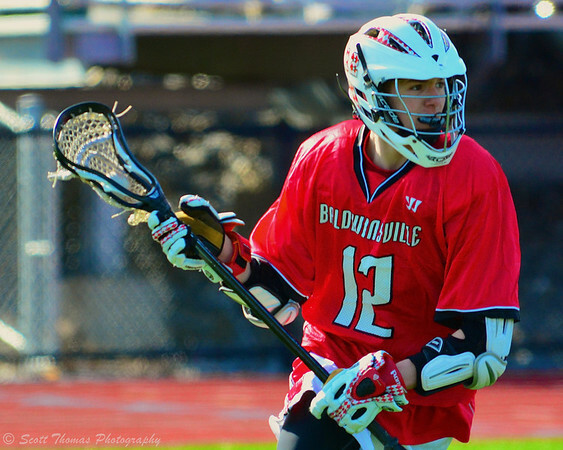 The game was a good one as Baldwinsville came back from being down by three goals to win it in the final quarter. 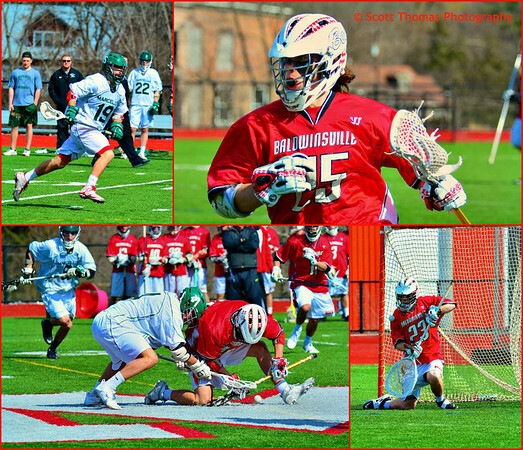 This entry was posted in Sports, Weekly View and tagged 80-400mm, baldwinsville, bees, field, high school, lacrosse, marcellus, mustangs, nikon D700, nikon D7100, spring, vr. Bookmark the permalink.